We miss giant arcade machines. Playing games on iPhones is alright, but it doesn’t have the immersive thrill of burying your face in a screen, manipulating the joystick, mashing buttons and being deafened by various beeps and buzzes. 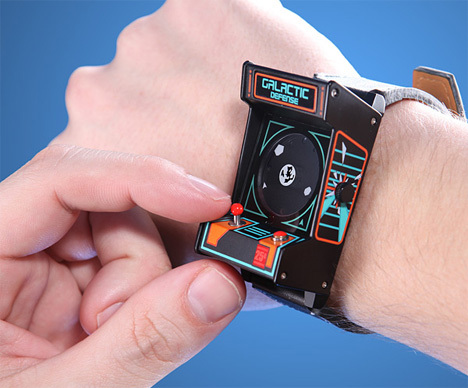 ThinkGeek must feel the same way, because they’re introducing a tiny arcade machine you can wear on your wrist. 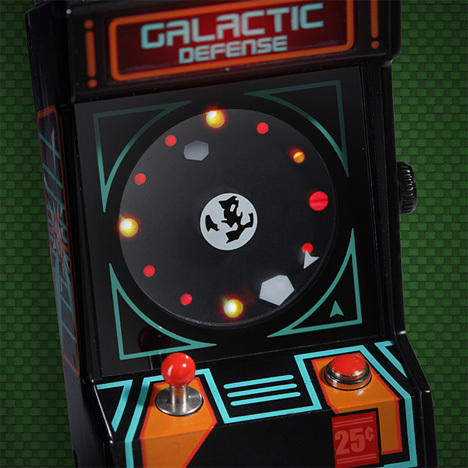 The Classic Arcade Wristwatch is an itty-bitty version of a Galactic Defenders arcade game. Although it doesn’t function as an arcade game, it definitely functions as a watch. The joystick doesn’t do anything, but the red button lights up the watch’s display with red lights and makes an awesome “PEW!” sound. The face of the watch is definitely the best part. Instead of second, minute, and hour hands, the watch sports space rocks in place of the hour and minute hands, and a spaceship in place of the seconds hand. Normally we’d make a joke here about watching time fly, but we’re too busy scrounging up $50 in sofa change to buy one. See more in Clocks & Watches or under Gadgets. March, 2014.